Product #1876 | SKU JAA132DA | 0.0 (no ratings yet) Thanks for your rating! 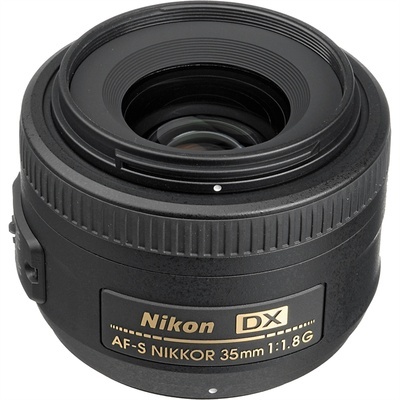 The Nikon AF-S DX NIKKOR 35mm f/1.8G Lens is designed for use with DX-format cameras and will provide a "normal" 52.5mm equivalent focal length. With an f/1.8 maximum aperture it is useful in low-light conditions and it has one aspherical element to help control distortion and aberrations. Also, it utilises Nikon's Super Integrated Coating to further minimise flare and ghosting in your images. Packing in a Silent Wave Motor AF system with a rear focusing design, the NIKKOR 35mm is able to lock focus quickly and quietly. Also, it has manual focus override for taking control whenever it is desired, and it can focus as close as 11.8" to your subjects. Additionally, it has a 52mm filter diameter and features a 7-blade diaphragm for smooth out-of-focus elements. The 35mm focal length closely matches a 50mm lens in the FX format. This is perceived to be a natural lens as it provides an undistorted angle of view that is similar to what the unaided human eye perceives. The incorporation of an aspherical element minimises coma and other lens aberrations, further improving image integrity. The Super Integrated Coating (SIC) enhances light transmission efficiency and offers superior colour consistency with reduced flare. The Silent Wave Motor (SWM) embedded in the body of the lens enables fast, accurate and quiet autofocusing. A rounded 7-blade diaphragm produces a more natural rendering of out-of-focus image elements.